The B-25 medium bomber, named for General Billy Mitchell, was one of America’s most famous airplanes of WW II. It was the type used by General Doolittle for the “Tokyo Raid” on April 18, 1942. Subsequently, it saw duty in every combat arena, being flown by the British, Dutch, Chinese, Russians and Australians in addition to our own US Forces. Originally designed as the NA-40 (an Attack bomber), the NA-40 was modified into the NA-62 (a Medium bomber) and re-designated the B-25. The B-25A first flew on February 1941, the aircraft had several modifications done, and when the last B-25J was completed a total of 9,816 were produced. Although the aircraft was originally designed for level bombing at medium altitudes, it was used extensively in the Pacific arena for treetop level bombing and strafing. This TB-25J S/N 44-30854 was delivered on 08 March 1945, it was modified to a TB-25N in March 1954 and was the last B-25 when dropped from USAF inventory on June 1960. It is being depicted as B-25B S/N 40-2344 flown by General (then LtCol) James H. Doolittle during the “Tokyo Raid” mission. The Doolittle Raiders trained for their secret mission at Eglin Field (now Eglin AFB), FL. 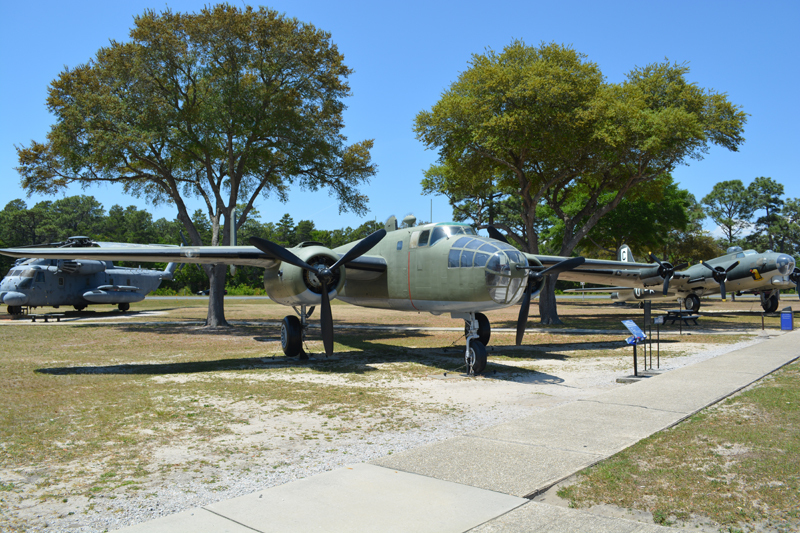 This aircraft was presented to the AF Armament Museum by the cities of Valparaiso and Niceville, FL on 15 September 1975.